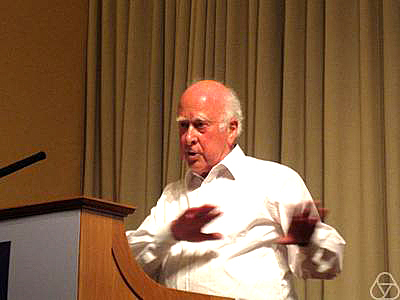 In 1964 Peter Higgs (pictured at left) proposed that an invisible energy field (later named the Higgs Field) filled the universe immediately after the Big Bang. This field was analogous to an electric field, it filled the universe, was invisible, but did not carry any electric charge. The theory suggested that as the newborn universe expanded and cooled, the Higgs Energy Field developed. At that time, one billionth of a second after the Big Bang, massless particles that had been traveling at the speed of light in a super hot plasma type of soup, interacted with the "field" and became massive (took on mass). Some particles were affected by the field more than others. The more strongly particles interacted with the field, the more massive they became. Without this field, says the theory, atoms, molecules, planets, stars and you and I would not exist. One can think of the Higgs Field as a very thin invisible gas (sort of like air) that completely fills the universe. Some particles traveling at the speed of light, photons for example, do not interact at all with the gas and zoom right through it continuing at the speed of light. Other particles, such as quarks, interact quite strongly with the field and slow down. To them the field is "sticky", like high humidity, and they absorb mass (weight) traveling through it at much reduced speeds. A particle's mass is simply a measure of how much it gets "bogged down" in the field. There is a whole range of masses and speeds as different particles inherently interact with the field with different strengths. Sometimes light behaves like a wave, i.e. sunshine, and sometimes like a particle. It can be emitted or absorbed only in packets (quanta). As a result of this wave-particle "duality", all quantum fields have a fundamental particle associated with them. For example, the photon particle is associated with light. Similarly, the particle associated with the Higgs Field is the Higgs Boson. We can not see the Higgs Field or the Boson just like we can not see the electro-magnetic field that light travels through. Most people think about outer space as being empty. However, most physicists are quite sure it contains dark matter, dark energy, and probably the Higgs Field. So, the vacuum of space is possibly not empty after all, it is just beyond our human ability to see anything. The Standard Model has successfully predicted the existence of the Top Quark, the W Boson, and the Z Boson. It is strongly backed by experimental data and has never made a false prediction. The only Standard Model particle predicted but not yet detected is the Higgs Boson. If the Higgs is found, the Standard Model will be considered completely verified. A disturbance with enough energy in the Higgs Field might cause a Higgs Boson to be formed. ATLAS released a picture (above) of the results of a proton to proton collision in which four high energy electrons (red lines) can be seen. This illustrates one of the characteristic decays that can be expected from the Higgs boson. From previous data obtained from the Tevatron at Fermilab and the LEP at CERN, the Higgs Boson (if it exists) was projected to have a mass between 115 GeV (billion electron volts) and 140 GeV. The inability to predict the mass of the Higgs Boson is one of many reasons most theoretical physicists believe that the Standard Model is not complete and will never be able to describe the whole particle story. Theoretical physicists are searching for extensions to the Standard Model that make it more coherent, more predictive, and more complete. Some possible theoretical extensions are Supersymmetry and String Theories. 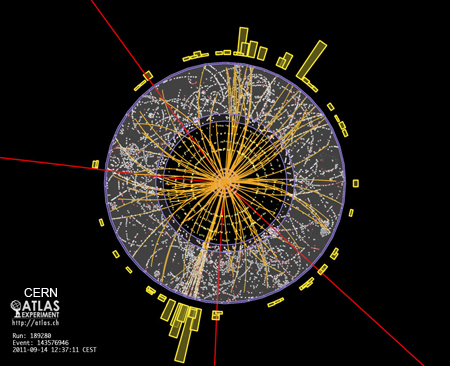 At the left is a sample collision from the CMS collider that "might" show a decay from a Higgs particle. The 4" green lines" (with red towers) are characteristic high energy electron tracks. The Higgs particle seems to have a mass which has made it very difficult for physicists to detect. Previous history pointed to a mass in the range of 115 to 140 GeV (billion electron volts). Experiments at the LHC concentrated on this region. Collisions during 2012 are running at a higher luminosity (number of collisions per unit of time) at a speed of 8 TeV (a 14% increase from 7 TeV in 2011) in order to maximize the opportunity for a Higgs Boson confirmation. On 4 July 2012, the CMS and ATLAS teams at the LHC independently announced that they each had confirmed the discovery of a new boson of mass between 125 and 126 GeV. 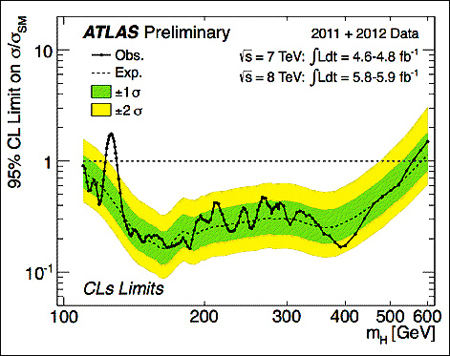 Shown at the left are the results from the ATLAS detector in the mass range of 110 to 600 GeV (billion electron volts) from the year 2011 and first half of 2012. The solid black curve reflects the observed data for the Higgs Boson for each possible mass value (horizontal axis). When the solid curve dips below a value of 1.0, the dashed horizontal line, that particular mass is excluded from Higgs consideration. Based on simulations, the dashed black curve shows the values in the absence of a Higgs Boson. (The green and yellow bands correspond to 68% and 95% confidence levels of the simulation results with no Higgs Boson present.) Net-net, a value above 1.0 is a positive sign that a Higgs particle may be present. 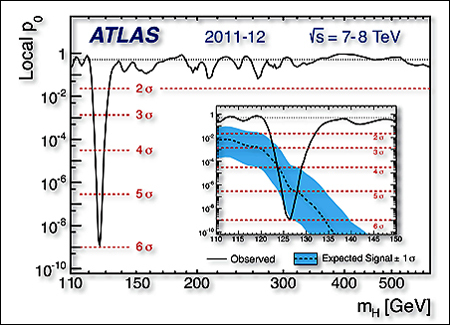 The ATLAS data has a peak blip at 126.0 GeV. The masses above 130 GeV can be definitely ruled out as the solid black line is constantly below 1.0. The corresponding high point from CMS is at 125.3 GeV. In particle physics, statistical evidence of 5 standard deviations (5 sigma) beyond background noise is considered "proof" of a particle's existence. 3 sigma is deemed to be evidence that a particle "may exist". The ATLAS chart at the left is a probability graph showing the probability of background noise (no Higgs) being that of the "observed" data p(o) for various masses (horizontal scale). Note that except for a mass of 126 GeV all the other probabilities are very small. At 126 GeV the probability that the signal is noise (rather than a real particle) is roughly 1 in 600 million with a standard deviation of 5.9 sigma. This means a new fundamental particle with a mass of 126.0 +/- 0.4 GeV is definitely being observed . The insert shows how the observed mass at 126 GeV is consistent with the Standard Model which is the dashed line with a blue one sigma confidence limit. CMS also showed a particle at 125.3 GeV with a standard deviation of 5.0 sigma. What Exactly Has Been Discovered? The new particle announced in July 2012 is indeed the Higgs Boson, the particle that explains how other particles get their mass, CERN scientists reported on March 14th, 2013. Physicists announced back in 2012 that they had found a new elementary particle weighing about 126 times the mass of a proton with more than 99% certainty. Now, after collecting two and a half times more data inside the LHC, physicists say the particle is definitely a Higgs Boson. The ATLAS image to the left is believed to be a collision resulting in a Higgs particle temporarily being formed and then decaying. "To me it is clear that we are dealing with a Higgs boson though we still have a long way to go to know what kind of Higgs boson it is," said CMS spokesperson Joe Incandela. 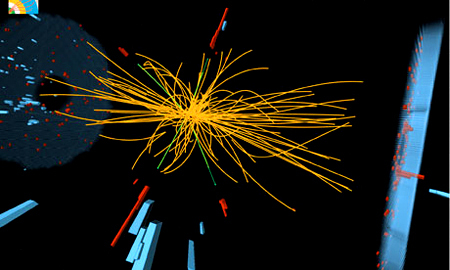 The scientists are not sure whether this particular Higgs Boson is the one predicted by the Standard Model or perhaps the lightest of several bosons predicted to exist by other theories. The Higgs particle should have zero spin, its parity should be positive, and its mass should be between 120 and 130 GeV. All of these attributes were confirmed by data from both the ATLAS and CMS experiments. Seeing how this particular particle decays into other particles will let physicists know whether this Higgs is the "plain vanilla" Standard Model Higgs. 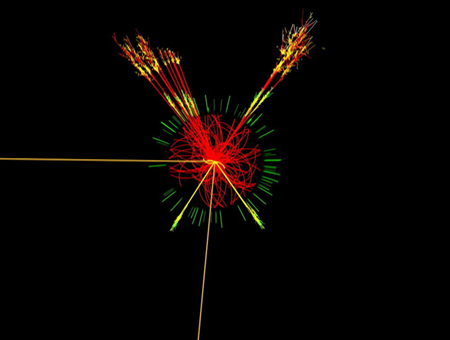 Detecting a Higgs Boson is rare occurrence. Just one is observed for every one trillion proton to proton collisions. Therefore, the LHC physicists say they need much more data to understand all of the ways in which the Higgs decays. This will not occur until 2015 or later when the LHC starts running again and more data at higher collision speeds is collected by the ATLAS and CMS teams.